Concord really isn’t that big a place to “travel widely” in, but that is the argument of Solnit’s Infinite City: every place contains an infinite number of “maps” with which we travel, and within her book Solnit creates a unique, intriguing, and entertaining series of maps of her city, San Francisco. Now, you know you are in heady territory when in the first three paragraphs Solnit makes multiple references to Borges and Calvino, both fantastic cartographers and creators of worlds that have never existed. Yet, Solnit is every bit as imaginative and perceptive. She reveals a given place (San Francisco) in ways that had never been categorized before and introduces new perspectives on the city that have never before been imagined. And this is how the book works. The “arbitrary selection of facts” are surprising and unconventional. There are maps of industries and bee migrations and “tribal neighborhoods” and gang-lands and right-wing bastions and bygone areas of entertainment and carousal. And the pairings are both startling and sensible. 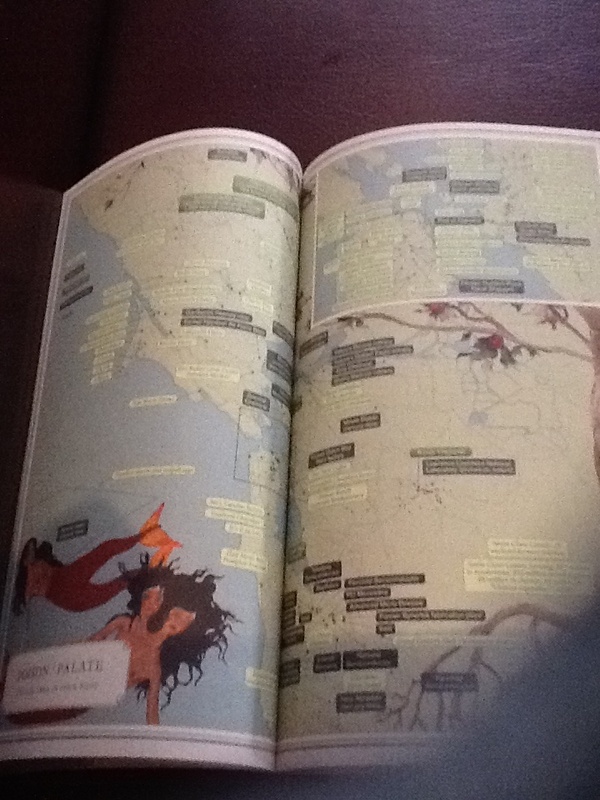 For instance, the map entitled “Poison/Palate: The Bay Area in your Body” is accompanied by Solnit’s essay “What Doesn’t Kill You Makes You Gourmet.” In both, the reader is given a map of the major dumpers of toxins into the environment (often food and wine growers) and the sites of delicious, food providers. (Often the two overlap.) The key to the map gives symbols for EPA SUPERFUNDS, Poison Sites, Palate Sites, Poison/Palate Sites and Wineries. The population map–the current population not the map of those who have left and those who are arriving–is set up as a “tribal” map. The expected ethnicities are cited–the Chinese, the Irish, the Korean, the Mexican–but they are accompanied by neighborhoods where the “tribes” include skateboarders, people with ties, transgender people, etc. Again, this is accompanied by a moving essay by Solnit about the ever changing population shifts of her city. But it is the pairings that are the most intriguing. 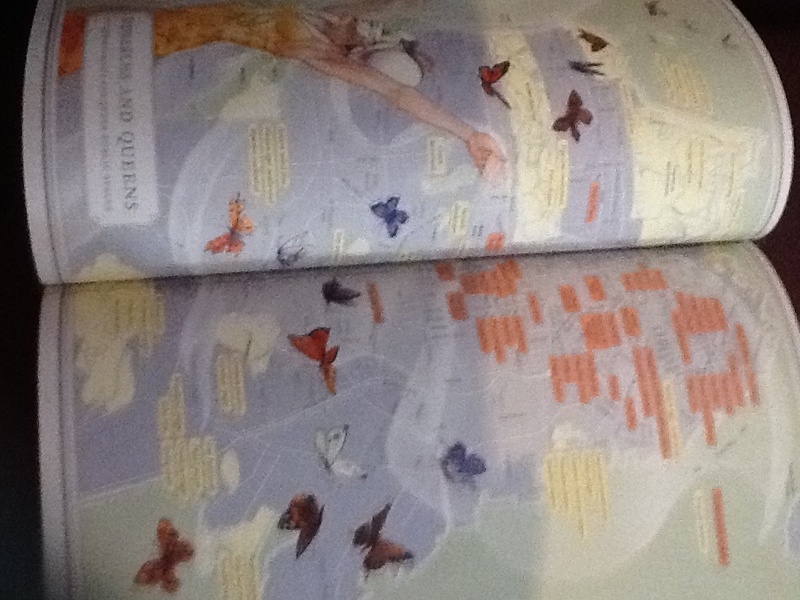 One map, entitled Death and Beauty, tracks the murders in the city during the year 2008 and the locations of Monterey cyprus trees throughout the city; another entitled Dharma Wheels and Fish Ladders lists salmon streams, hatcheries and viewing sites along with the location of Zen monasteries, schools, and core sites; and still another, entitled Monarchs and Queens, reveals the locations of various butterfly locations and queer public spaces. Each of the twenty-two maps are jewels of color, design, and information. They are beautiful, as are all of the illustrations throughout. 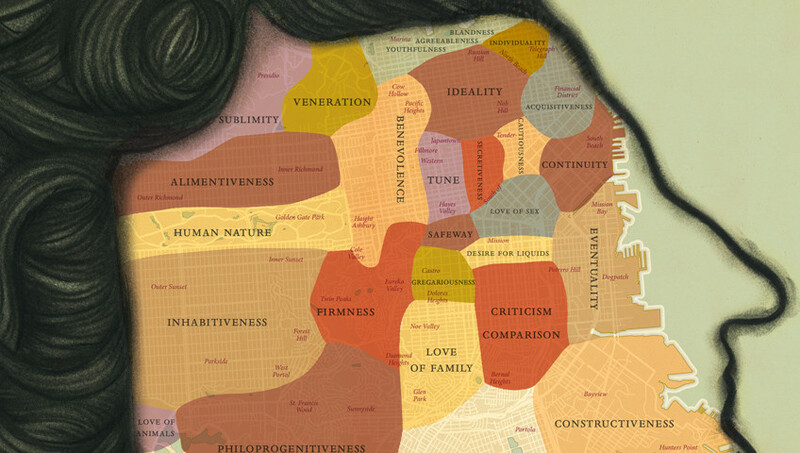 While Solnit did not write all of the essays that accompany the maps, she did write the majority and her fellow essayists are similar in spirit, similar in the way they look at their ever-changing city. In a recent piece for the London Review of Books entitled “Google Invades” (February 2013), Solnit bemoaned the changes that have occurred in her city with the influx of Silicon Valley money. She felt that the variety in the city’s fabric–in its economics, its life styles, its ethnicities, its politics, and its arts– was being leveled and watered-down with the influx of cyber-millionaires. The city–not just a neighborhood– was being gentrified. 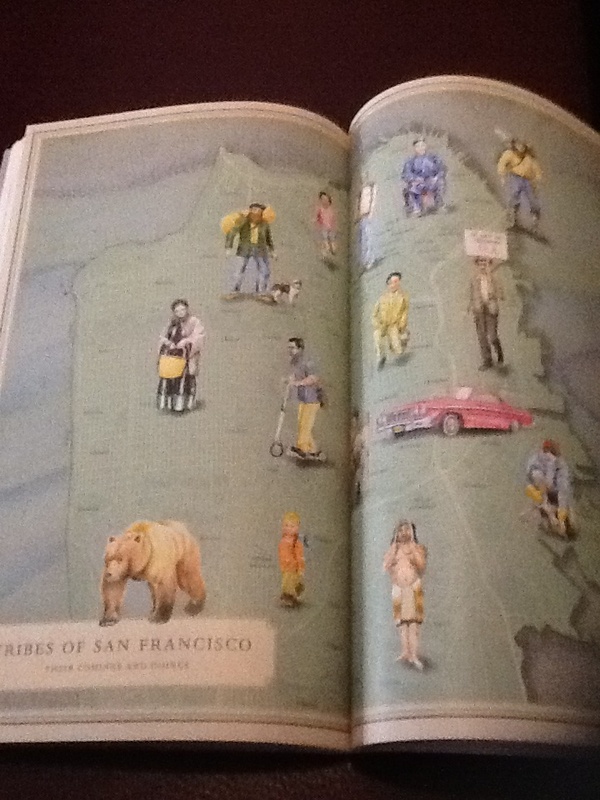 Solnit sees her city, San Francisco, in many, various ways, in multiple perspectives that have accrued layer after layer through the years that she has lived there. These views are both nostalgic and forward-looking, while still very much ensconced in the present, no matter how ethereal that might be. And while some of these layers may now have physically vanished, they remain in her memory, in her view of the city. And they remain in this amazing, attractive, and addictive book. Wow, this is an amazing find of a read! I wonder if other such great cities, such as Chicago have ever been “mapped” in a similar way! It truly is an amazing book. I think I heard that she is planning to do other cities, but not sure which. Thanks, as always, for reading.